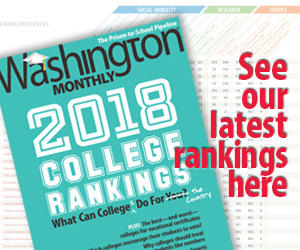 Washington Monthly | What is it with those C Street guys? What is it with those C Street guys? WHAT IS IT WITH THOSE C STREET GUYS?…. It seemed odd when Mississippi’s Chip Pickering decided not to run for the Senate a few years ago, after Trent Lott’s departure. This Roll Call report suggests there was an explanation we weren’t aware of. The wife of former Rep. Chip Pickering (R-Miss.) has filed a complaint in a Mississippi circuit court alleging that Pickering had an extramarital affair while serving in Congress and that his decision not to seek retiring Sen. Trent Lott’s (R) seat followed an ultimatum from his mistress. Leisha Pickering filed an alienation of affection complaint July 14 that alleges her estranged husband conducted an affair with Elizabeth Creekmore-Byrd of Jackson, Miss., while living in the C Street complex in Washington, D.C.
Chip Pickering filed for divorce from Leisha in 2008, but the divorce is not yet final. The couple has five children. The complaint also asserts that Creekmore-Byrd’s ultimatum led to Pickering’s decision to not seek the Senate seat vacated by Lott. Yes, it looks like we have yet another conservative Republican who preached “family values,” but couldn’t quite meet the personal standards he said others should follow. But what’s especially interesting about Pickering in particular is the fact that he lived in suddenly-infamous C Street house, home to “The Family.” It’s the same house where other scandal plagued far-right politicians John Ensign and Mark Sanford lived.